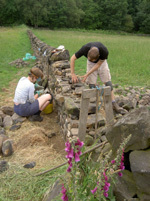 Join the drystone walling courses at Blackbrook farm, conveniently located in the South Yorkshire countryside, one kilometre from the Peak District National Park and only a ten minute drive from Sheffield City Centre - Manchester 50 minutes. BEE has been running drystone walling courses since March 2006 and in that time we have taught basic walling skills to over 500 people. Participants have ranged in age from 13 to 70 and one third of these have been women. Due to our low instructor to student ratio ( 1:4 on beginners courses) we are able to ensure that students complete their particular section of a wall, to a professional standard albeit at a more leisurely pace.